Among the icons on the left side of the Chromebook screen is one icon that looks like a grid of nine boxes. This is your App Launcher icon, comparable to the Start button on Windows. 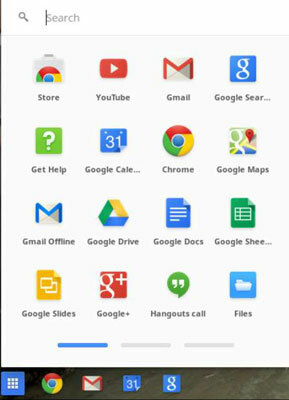 When you click the App Launcher icon, you reveal the App Launcher, a pop-up window containing a number of applications. Until you add applications yourself, the only apps that appear here are the default ones that come with your machine and any apps already associated with your Google Account. These buttons indicate the presence of additional windows of applications. The color of the button indicates which window is active. You can navigate between windows by clicking these buttons. Click and hold the application icon that you wish to move. Drag the icon in the direction of the window in which you would like to place your selected application. Wait patiently until the window shifts. Drop in the desired location. When you finish browsing your apps, you can close the App Launcher by clicking outside of it or by clicking the App Launcher icon on your shelf.